Operating for many years in his native village of Kurówko, Daniel Rycharski has become known as a visual artist who takes up socially important issues, including the meaning of community and the relationship between conservative identity and the present. Rural street art designs and periodic exhibitions at his public-art project Galeria Kapliczka became the basis for studying the process of transforming rural society (see: artistic competence). Pomnik Chłopa (Monument to a Peasant), created in 2015, was conceived as a tool for teaching about a village pushed to the margins of social history, at the same time using the countryside as a habitat for art. The project arose with the support of ethnographers and anthropologists and the active cooperation of many people involved in the life of Kurówko (see: cross-pollination). A construction from repurposed farming machinery and equipment contributed by local foremen became a mobile base for a realistic sculpture presenting a “typical” small farmer struggling to make ends meet through agricultural production. 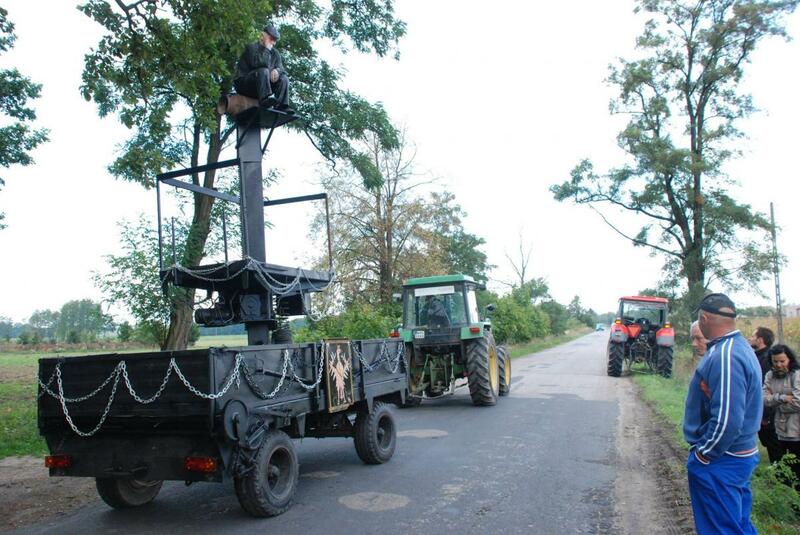 During its journey from Kurówko to Kraków, the monument was passed from hand to hand (or tractor to tractor) and used as a kind of mobile pulpit for speeches and gatherings. It is a tool for articulating the voice of the residents of the locales it visits. The expedition also created a secular festival around the object, which plays with class stereotypes and images of rural identity (see: coefficient of art). In today’s political reality, this project functions as an instrument for dialogue, seeking to negotiate the tensions arising within the rural community during the era of late capitalism and smooth away strong social antagonisms and divides. The report presented in exhibition consists of the monument Pomnik Chłopa , which has travelled from Kraków to the Museum of Modern Art in Warsaw, where it will remain until April 10, 2016. Courtesy Daniel Rycharski.